Sudeera joined the CeRDI team as a Web Developer in 2013. Prior to joining CeRDI, Sudeera worked as the Web Administrator of the University of Colombo in Sri Lanka. During his career he has gathered invaluable skills in web development and implementing web based tools for academic activities. 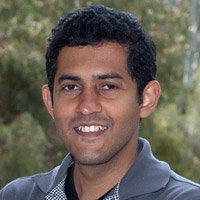 Sudeera completed his Bachelor of IT at the University of Colombo in 2008.